After a first day spent meandering through the streets of Paris on foot and sampling some of the city’s finest culinary offerings, for Day Two Emily and I decided to get in deep in one of our favourite neighbourhoods and delve into the city’s surging bistronomy. Paris is a city that constantly evolves, and I’m always looking for new ways to experience it. City Art Insider is the brainchild of two extraordinary “Carols”—French native Caroline Etter and Toronto transplant Carolyn Smith—and together they fashion deeply personal and highly curated art (and artist) experiences. Whether it’s helping you to plan a significant acquisition for your collection or simply immersing you in the vibrant behind-the-scenes life in the city’s coolest contemporary galleries and artist studios, the dynamic duo seem to know everyone and have access everywhere. We spent the morning in the Marais dropping in for coffee with gallery owners, viewing private exhibitions, learning about the newest up-and-coming artists, and poking around in the storage rooms to view recent works. The Coulée verte, or Promenade plantée, makes for a gorgeous stroll. In order to truly enjoy all of the culinary indulgences that Paris has to offer, I think it’s critical to balance the hours around the table with some hours of physical activity, and with the Vélib bike share system continuing to expand its reach across Paris, it’s never been easier. Once you figure out the mechanics of how to unlock the bike (the self-service navigation is surprisingly straightforward), the best thing to do is to jump on and start riding. Paris is a city that lends itself to spontaneous exploration, and the locks make it easy to hop on and off the bike. If you prefer to do some walking, you can do as we did and combine both with a bike ride to the start of the Coulée verte, an elevated tree-lined park built along the top of an obsolete railway/viaduct (and the original inspiration for the celebrated Highline in New York) just east of the Opera Bastille. The elevated green belt runs for five kilometres, providing a wonderfully secluded and lush garden in the sky for a leisurely postprandial stroll. I like to bookend a fancy Michelin-starred meal with something much simpler for my second and final night in Paris, and my quest for the perfect Parisian bistro currently has three finalists on the short list. Josephine “Chez Dumonet” is a beautiful art nouveau bistro in Saint Germain that serves old fashioned, slow-cooked classics (boeuf bourgignon, morels stuffed with foie gras, etc.) better than just about anyone else. For something a little more bohemian (but equally old fashioned), Le Baratin in Belleville is helmed by Argentinain-born Raquel Carena, who produces heartfelt comfort dishes like ox cheeks braised in red wine and soup de poisson, and is known as the haunt of great chefs like Joel Robuchon on their nights off. Finally, for a more contemporary experience, Le Comptoir du Relais near Odéon is where former Michelin three-star chef Yves Camdeborde pioneered the bistronomy movement (serving high-calibre food in bistro settings) with dishes like braised lamb shank and steak tartare. Reservations require months of advanced planning, but if you don’t secure a coveted dinner spot, drop by for lunch, when reservations are not accepted. 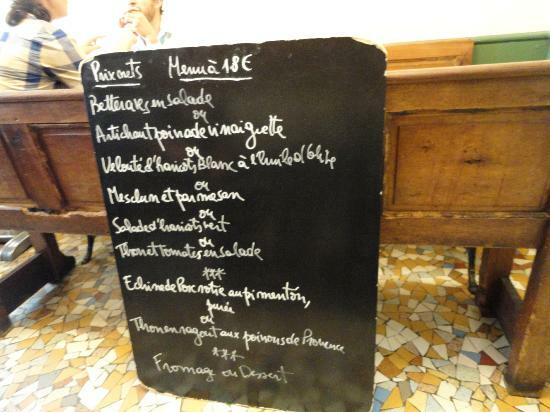 This time around, Emily and I chose Le Baratin for our final meal, where we immediately felt like we were dining en famille as fellow guests passed around the chalk board menu and Raquel’s somewhat gruff husband dispensed advice on wine. The perfect finish to a whirlwind Weekend in Paris.